2. Reduce heat and add onion seeds, dried red chillies, garlic and onion. 3. Stir fry for 3-4 minutes. 4. Mix in the tomatoes, shredded coconut, salt and coriander powder. 5. Add the fish pieces to the mixture and turn gently to cook evenly. 6. Simmer and cook for 5-7 minutes. 7. Stir in the water, lime juice and chopped coriander. 8. Cook for a further 3 to 5 minutes or until the water evaporates. 9. Remove to a serving dish and serve hot. 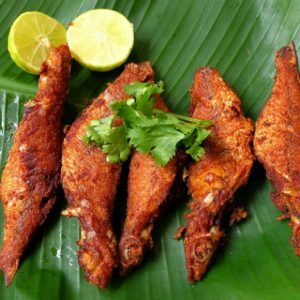 Feel free to comment or share your thoughts on this Fish Fillets in Coconut Sauce Recipe from Awesome Cuisine.